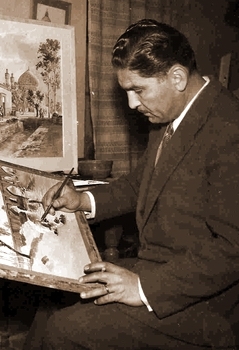 Born in 1913 to an Armenian family in New Julfa, Isfahan, Iran, Sumbat is the most celebrated watercolorist of this ancient capital city - the center of Iranian arts and crafts. He was influenced by both western and eastern artistic styles, and by Armenian and Iranian traditions. Sumbat's paintings describe scenes around his hometown and the ordinary life of people living in the surrounding villages and towns. They possess a lyrical quality, an extraordinary harmony of colors, and a striking honesty of expression. During his 65 years of artistic career, he produced thousands of watercolor, gouache and oil paintings, which are now scattered throughout the world in private collections and museums. He lived in Iran until 1980, then moved to the United States where he died in 1999. In addition to Iran and the United States, he traveled and painted in Armenia, England, France, Italy, Lebanon, Saudi Arabia and Switzerland. You are invited to explore this site and enjoy Sumbat's art work. You can learn more about Sumbat's life by reading his biography and seeing the picture albums. More information can be gained from the bibliography and list of exhibitions. A limited number of reproductions of Sumbat's works are available. Click the buttons to the left to learn more. Please send any comments and suggestions to: adk@Sumbat.com.